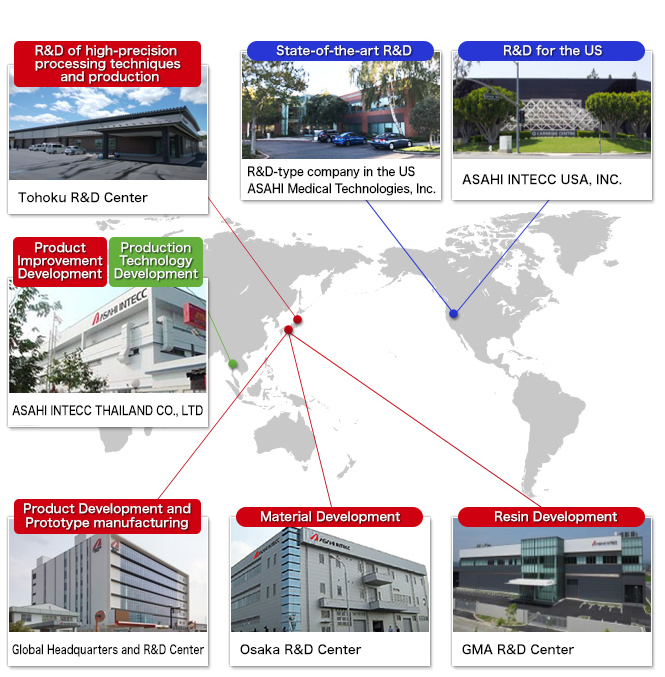 R&D - TECHNOLOGIES | ASAHI INTECC CO., LTD.
With a basic policy of investing at least 10% of net sales into R&D expenses, we continue to develop products while maintaining close ties to the medical front. Since its founding, our R&D-type company group has positioned R&D activities as one of the most important management matters. In addition to providing advanced and highly original material processing technology, principally the four core technologies for wire drawing, wire forming, coating and torque, our Group is also able to develop and produce products with materials and functions unique to the Group. This is made possible through our integrated production system that works from raw materials up to the finished products. It is a unique strength of the Group to have technological feedback between the medical device field and industrial device field, something that is rare among other companies in the business, as well as the technological cooperation between the R&D base in Japan and the production bases overseas. In addition, in recent years we are enhancing our system of joint R&D with top doctors in various fields who have ample experience in the medical front line, thereby developing products in close connection to medical practice. The fusion of such is a large factor in our differentiation with competitors in the medical device field and our continued supply of competitively superior products. In globaliz our R&D system, we are building a system capable of handling prototypes and enabling us to directly reflect needs and evaluations from doctors, the end customer, at ASAHI INTECC USA, INC., our consolidated subsidiary and direct sales base in the US. Moreover, we will proactively pursue improvement of our existing product line including examination of product specifications with further expansion of R&D base of our consolidated subsidiary ASAHI INTECC THAILAND CO., LTD. In Japan, we will realizeimprovement of the R&D environment close to the clinical site by constructing a new office building within the premises of the Seto factory, which is the center of the Group's R&D base. In addition, we will further enhance our domestic R&D system with the launch of operations at the Tohoku R&D Center as the core of development for the Group's high-precision processing technique. It is our basic policy to invest at least 10% of consolidated sales as R&D expenses to support the above. We will continue our R&D activities for the development our Group’s one-and-only technologies and to supply “number one” products to our clients.